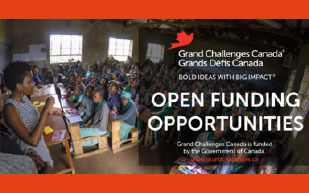 Grand Challenges Canada is seeking bold ideas for products, services and implementation models that could transform how persistent challenges in reproductive, maternal, newborn and child health are addressed in low- and middle-income countries. Successful proposals will be awarded seed grants of up to $100,000 CAD over a maximum of 12 to 18 months. Stars in Reproductive, Maternal, Newborn and Child Health helps refresh the pipeline of innovations for the Every Woman Every Child Innovation Marketplace. Of particular interest to Grand Challenges Canada are innovations to improve reproductive, maternal, newborn and child health in humanitarian contexts, notably among internally displaced and refugee populations, as well as innovations that improve the sexual and reproductive health and rights of women. For more information about the Stars in Reproductive, Maternal, Newborn and Child Health Request For Proposals and eligibility criteria, please click HERE. Application deadline is July 19, 2016, 15:00 ET. With the ultimate goal of increasing human capital and tackling existing inequalities, Saving Brains seeks bold ideas for products, services and implementation models that protect and nurture early brain development in a sustainable manner. Successful proposals will be awarded seed grants of up to $250,000 CAD over a maximum of 24 months. Saving Brains helps support the Thrive element of the Every Woman Every Child Global Strategy for Women’s, Children’s and Adolescent’s Health – and refreshes the pipeline of “Thrive” innovations for the Every Woman Every Child Innovation Marketplace. For more information about the Saving Brains Request for Proposals and eligibility criteria, please click HERE. Application deadline is July 29, 2016, 15:00 ET.